I studied economics. Then I worked at Treasury. So I should know about economics. But instead I find it confusing. There are two types of things I find confusing, normally. One: things that are complicated. The other: things that don’t make sense. Fortunately, Paul Krugman has just written an article in the New York Times which confirms what I hoped. Turns out large parts of economics don’t make sense! Krugman has good evidence for how ridiculous some economic theory is, in the form of the financial and economic crises we’re having. This makes me feel heaps better about not getting it. The article goes through some of the biggest, dumbest ideas in contemporary economics and calmly explodes them. His article has only been around for about a week, so it might be too soon to call it seminal. But, you know what, screw the definition, I’m gonna say it: “This is a seminal publication in the history of popular economics.” I intend to give you the guts of what he’s saying in a couple of easy-to-see chunks. Then I’ll present a few objections of my own. 1. The big problem is not that they didn’t see it coming (because some economists did). Not even that they didn’t believe it could happen. But that they believed it couldn’t happen. Micro: looks at the individual players on the team, wants to make sure they are fit and skilled and strong. Assumes the coach is doing the right thing. Macro: looks at the team as a whole and worries about what the coach is doing. Assumes that all the players are fit and strong. So in microeconomics we wonder about the price of petrol, or corn chips, or an hour of labour and chill out about what the government might be up to with its taxing, spending and interest rates. In macroeconomics we look at total government spending, central interest rates, and trade deficits, while not really worrying about the markets for cheetos, doritos and other basic foodstuffs. The macroeconomists are the ones who are supposed to be worrying about recessions. But the bad (or, to use the technical term, neo-classical) macroeconomists in the Krugman article don’t really believe in recessions. The problem seems to be that they have borrowed an assumption from the microeconomists. They assume that everyone is acting rationally, in their own best interests. This makes sense at the micro-level. Why would I buy a 3 dollar coffee, unless I was sure that it would make me a happier person than a guy with three dollars and no coffee? Why would someone sell me one, unless they valued the 3 bucks more than the coffee they’re giving out? But the implications of this assumption are troubling. The bad macroeconomists reckon that if everyone is acting in their best interests, that any recession must be in everyone’s best interests. They say that the productive environment has disappeared, so doing less business makes sense. And they say the workers who were laid off must have wanted a holiday. This is what they believe. If this was my conclusion, I’d say that all that self-interest must have got its wires crossed, and that an aggregate of self-interest might not equal the sum of its parts. But the bad macroeconomists do not say this. Now, these wackos wouldn’t be a problem if they were standing on street corners, dribbling into their beards and wearing sandwich boards. If the recession is in everyone’s best interest, then the best thing we should do is just chill. They reckon that a big old stimulus plan is a waste of dough. They also reckon that regulating markets is a bad idea. If everyone is acting in their own best interests, anything the government does will make people worse off. Forget that the regulated banks in Australia are chugging along smoothly while the American ones choke on a flotsam-filled swill of confusion and bad debt. 3. Fortunately, the bad macroeconomists are not the only kind. There are also economists we will call neo-keynesians, or ‘good guys’. 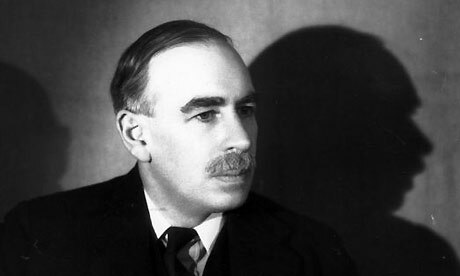 Keynes is an Englishman who died in 1946. He developed his theories in response to the Great Depression. He thought that a recession looked like a shortage of demand (people wanting to buy things), and so figured that the Government should pick up the slack. When economic growth in America finally picked up with the massive government expenditure of the second world war, he looked right. Our ‘good’ macroeconomists have developed his views, and the $900 handouts the Australian Government has been bestowing, depend on this long-dead, much-derided Englishman’s theories. 4. So, the bad guys and the good guys don’t agree, but the evidence is stacked in favour of the good guys? Where’s the issue? The problem is in figuring out where in the assumptions about rationality fail. The Keynesians like to say that people are irrational, but it feels too simple to me. If I buy something, it’s a rational decision, axiomatically. ‘whether people maximise their own self-interest’ is a stupid question. A more interesting question might be what they perceive their self-interest to be (i.e. over what time-scale they are maximising; when they consider the costs of finding more information to be greater than the benefit of that extra information; when the get more benefit from acting to punish someone else). 5. The other problem with economics is too many mathematicians. Beautiful theory will not explain an ugly reality. Economics is not physics, but an answer that comes cloaked as a proof and goes to four decimal places can be very persuasive. Any serious social science should be disputable. 6. Allied to the problem of too much math is a desire for too much certainty and consistency. All arguments look good on their own terms. We generally can’t do a wholesale analysis of their assumptions, so we compare the arguments conclusions to a framework. I suspect that the framework that is simplest and most potent holds the most sway. In a ‘science’ without experiments (like macroeconomics), what you need to be credible, is not theories that match reality, but a cohesive body of theory. Cohesion can be achieved if your assumptions are crystal clear and brook no exceptions. Thus extreme assumptions collect adherents. For this reason, statistical arguments always look good, as people lack the capacity to argue that statistics are irrelevant or don’t make sense. Arguments along moral lines, that brook obvious exceptions, may be less compelling. Economics is a young science so we shouldn’t be too hard on it. Theory catches up observation only very slowly. This catching-up means that over time we should hopefully observe economic theory make real-world sense. However, if it still mystifies me, my excuses will be gone. Damn. He shows, I think, how you can make good points and still be wrong. He’s failing to step back and see the big picture. The other point of interest is that those economists who did ‘see it coming’ were generally of the variety who forecast 10 of the last 2 recessions. Most of the prescient economists were of a pessimistic nature, and didn’t really pick the change in fortune.